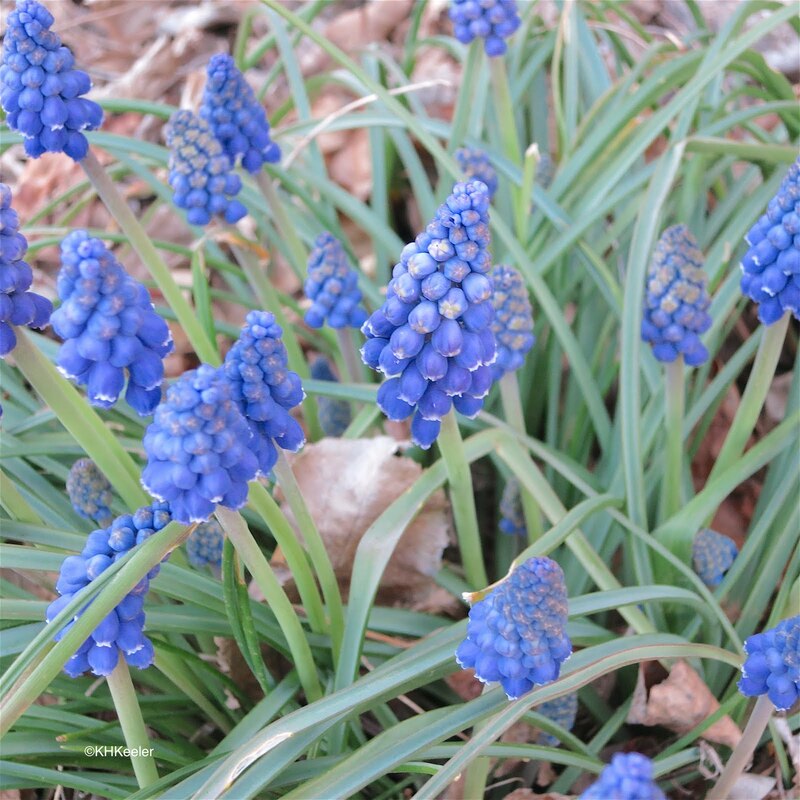 Grape hyacinths are pretty blue spring flowers, in my yard aggresively seeding in everywhere. Lets call them "easy to grow." 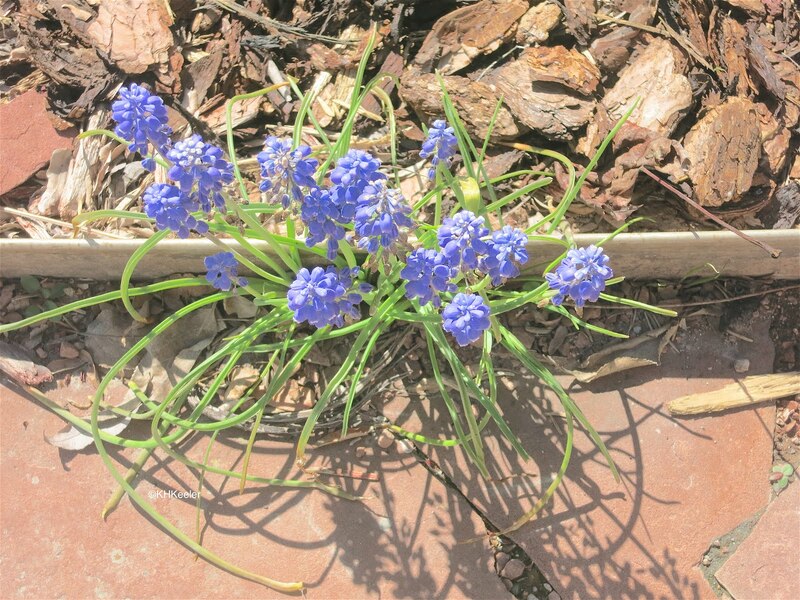 My grape hyacinths are in the genus Muscari but that common name is also used for plants in the closely-related genera Leopoldia and Pseudomuscari. None of them are especially closely related to garden hyacinths (genus Hyacinthus) although all of them are in the asparagus plant family (Asparagaceae). 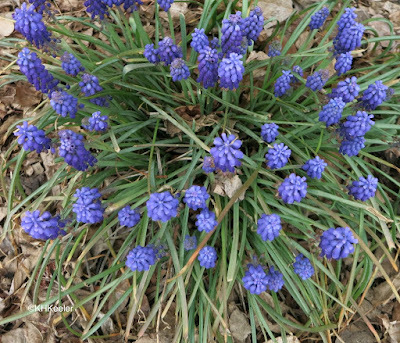 Originally botanists lumped grape hyacinths into Hyacinthus but in 1754 the grape hyacinths were split out of Hyacinthus and in 1970 Leopodia and Pseudomuscari were recognized as separate from Muscari. 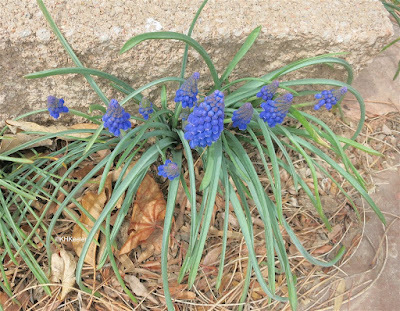 Muscari means "musk" in Greek, relating to its scent. Leopoldia is for Grand Duke Leopold II of Tuscany. Pseudomuscari is "imitation muscari", that is very like Muscari but not the same. Native to the Middle East, they have been popular garden flowers in Europe since the 1500s. 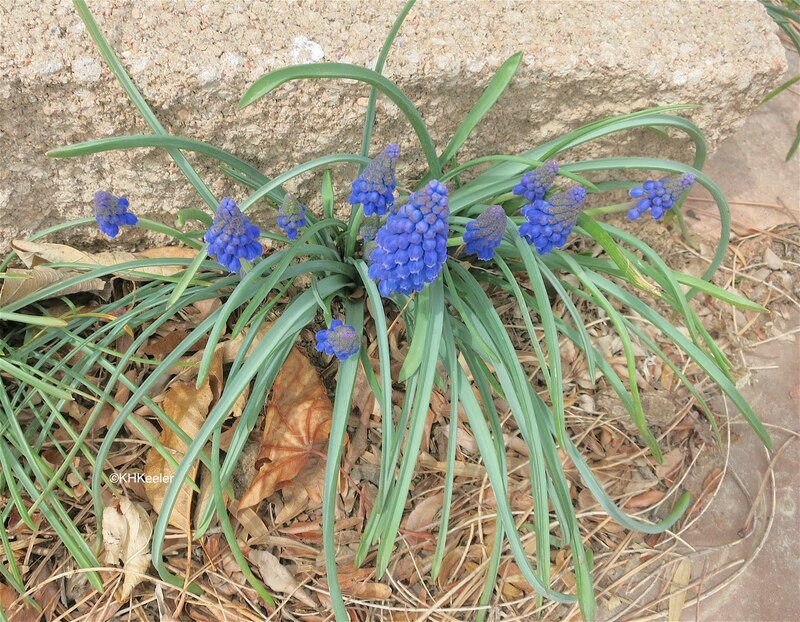 All three genera are widely grown in Europe but only Muscari is widely grown in North America. The USDA Plants website lists four species of Muscari as having naturalized in North America, the Armenian grape hyacinth (Muscari armeniacum,) the common grape hyacinth (Muscari botryoides), the tassel grape hyacinth (Muscari comosum properly Leopoldia comosa according to The Plant List website see photos) and the starch grape hyacinth (Muscari neglectum). A sample of plant sellers online included these species plus Muscari aucheri, M. latifolia, M. macrocarpum, M. racemosum and M. paradoxum (actually Bellevalia paradoxa). My photos are probably all the Armenian grape hyacinth M. armeniacum. They are small plants that flower in the spring from a bulb. 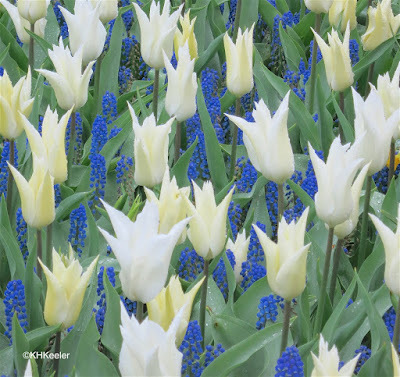 Most garden varieties are blue, a few a bit more purple or red, some nearly white (see varieties at Fine Gardening and Dave's Garden). In the 1960s and 1970s a Neanderthal burial in a cave in northern Iraq was excavated. One man (Shanidar IV) was buried on a bed of branches and flowers, about 50,000 years ago. Among those flowers were grape hyacinths. Only the pollen remains, but it occurs in clusters (indicating the flower lay on the spot and decomposed) and deep in the cave (somebody carried it in). While the flowers have could have been used medicinally, author Leroi-Gourhan suggests, based on their low medicinal value and the presence of other bright flowers in the burial, that they were likely chosen for their color. So, a flower appreciated by people for 50,000 years. 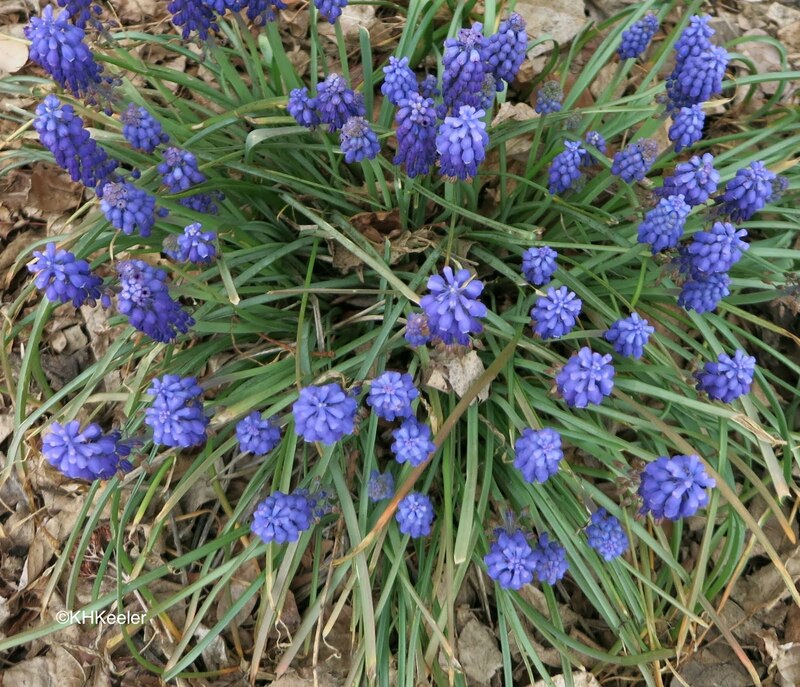 Grape hyacinths are attractive to bees, butterflies and other small insects. Since they flower relatively early in the growing season, they can important in providing food for early-emerging pollinators. In my yard, they set lots of seeds and volunteer all over the yard. Because of the bulb, they are very hard to weed out when under the edge of a paving stone or other solid object. This one is in the walk, the bulb deep enough that I haven't dug it out successfully. 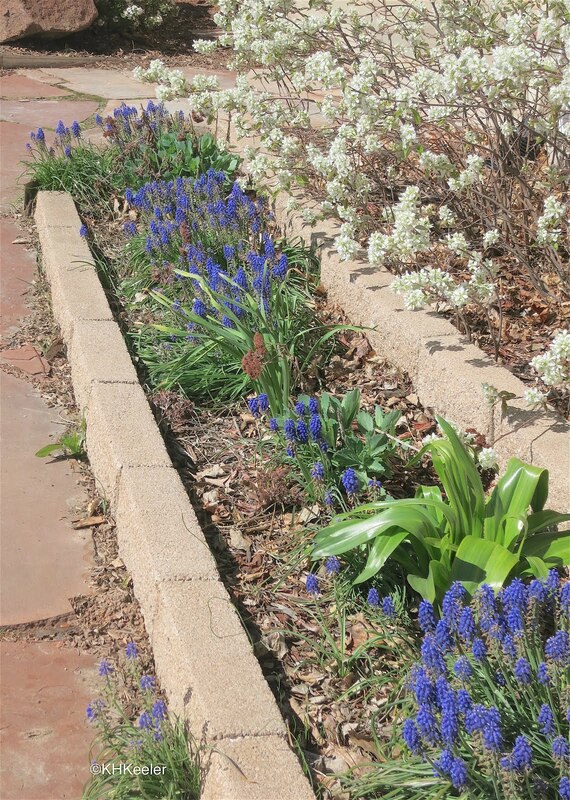 As part of spring plantings grape hyacinths can be gorgeous. This is from Keukenhof Gardens, Amsterdam, Netherlands. Grape hyacinths are bright-colored, easy-to-grow spring bulbs. Even though they grow so well they come up in places I don't want them, I am pleased with them. Leroy-Gourhan, A. 1975. The flowers found with Shanidar IV, a Neanderthal burial in Iraq. Science 190: 562-564. Soleki, R. S. 1975. Shanidar IV, a Neanderthal flower burial in northern Iraq. Science. 190: 880-881. Great post, thank you. I think of bulbs as multiplying by division, the clumps getting larger with age; I never think of them seeding around. So, I like your photo of the Muscari, inconveniently located under the walk and far from the originally planted parents, an obvious product of seeding. Have you ever seen seeding of daffodils? Also, love the Neanderthal story; I thought of Neanderthals as using plants for food/medicine, but it is now lovely to think of them appreciating the beauty of flowers, esp. as many of us who are getting ourselves tested on ancestry sites find out that we have Neanderthal genes!